When writing about my second coat muslin, I mentioned I wanted to alter the sleeves. More specifically, to set them lower into the bodice and adding ease to the arm to allow for a good range of movement. Kimbersew asked for an explanation about that. It's actually a trick which is included in the better pattern making books (best known of which is probably Winifred Adrich's Metric Pattern Cutting). As usual, I won't be copying the instructions from the book. Largely because I don't want to infringe their copyright but also because every pattern making book I know of, applies this method (or one very much like it) to a few specific sleeves, while I think I could explain it a lot better in the context of altering sleeves in general. I going to illustrate this with pictures showing a normal set-in sleeve but it works just as well with (half)raglan sleeves or sleeves with a square bottom of the armscye. Imagine your basic, fitted sleeve. It has a high armsye and a sleevehead shaped like this, which will include some ease (Note the markings on the sleeve pattern piece, the double mark in the back set-in marking). In some garments, especially in coats, you may want a lower armscye to allow the garment to worn over other clothes. If you alter the armscye just a little, a rather simple rule applies: Lower the edges of sleevehead by half the amount with which you lowered the armsye. Then, widen the sleevehead under the set-in marks for as far as needed to match this measurement on the bodice. This method works well if you only need 1 or 2 cm of extra room under the arm. Any more and the sleeve will, at even the slightest movement, show strain in the area marked in grey. 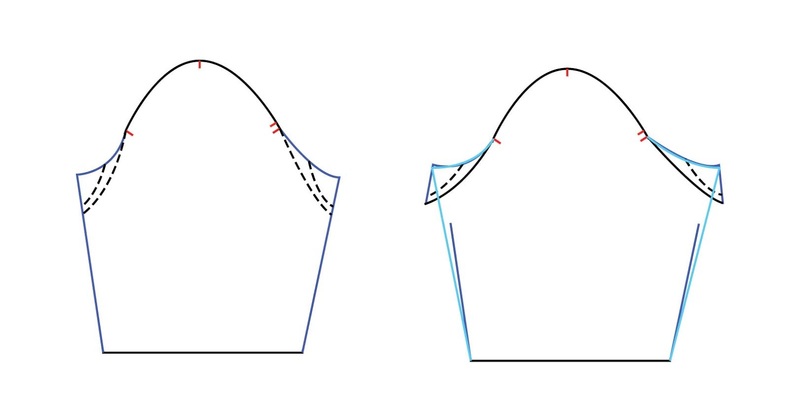 Nevertheless, it is always the first step when re-drafting a sleeve for a lowered armscye. There are two ways to deal with this. The first, shown here on the right, is used a lot in sport(y) clothes. This method involves re-drafting the sleevehead making it wider and shallower (when doing this you can eliminate the ease in the sleevehead). This will put the sleeve in a different angle to the bodice (in the previous examples, the sleeve's natural position is hanging straight down, after this alteration, it's half-lifted. In sports, you usually use your arms in some way, hence the popularity of this sleeve in sportswear) and as a result, dramatically alter the over-all look. For my coat, I didn't want the sporty look, so I used this method: Cut along one of the dotted lines at each side of the sleeve (so, either at the set-in marks or between it and the edge of the sleeve. 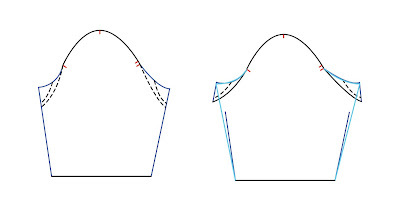 Which is better depends on the original shape of the sleeve). Pivot the wedges upwards with the point on the sleevehead staying in place. Open the underarm seam up by about 4 to 6 cm. Re-draft the underarm seam and tweak the outside edges of the sleevehead if necessary (they shouldn't be pointing up). I hope this makes sense to you. As ever, feel free to comment or email me with questions. Obviously any sleeve alteration you make should be tested out first in a muslin. Thanks for the explanation! I often struggle with this. I'll have to give this a go. I have a couple of patterns with that problem. Thanks! Thank you for sharing. I love getting ideas on sleeve changing. I need to flatten most caps for my arms. Hi, thanks for sharing nice information with us. Very interesting, thanks for taking the time to share this. Your finished coat is absolutely fabulous! thanks so much for this! I really appreciate the depth of your knowledge and the generosity of your explanations- and what a beauty of a coat!